A tower of blocks, shaking hands, one small mistake and everything comes tumbling down. That’s how most of the members of the new JENGA Club at Kennedy spend their lunch time weekly. Jenga is a game made up of wooden blocks that can be played with a multitude of players; each player has to take out one block at a time without making the tower fall. Founded by Parker Scarpa and Christopher Lee both members of the Class of 2019. 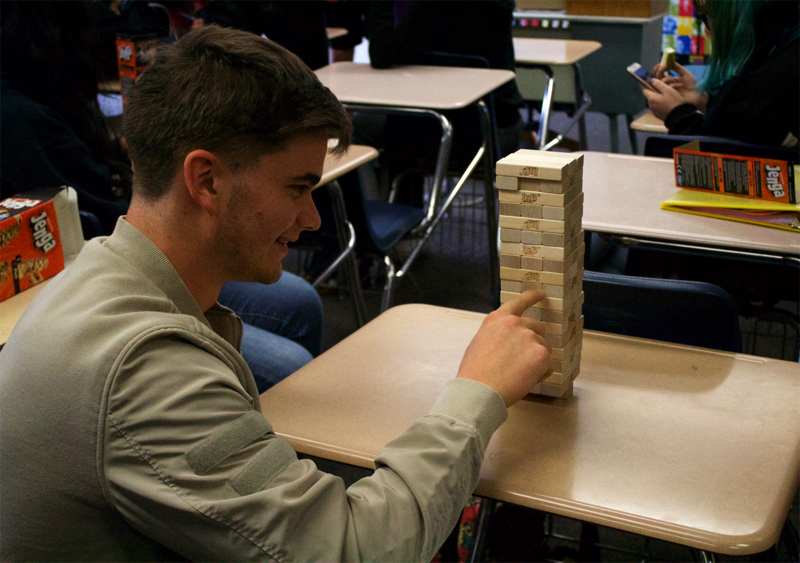 Jenga Club provides a fun and safe space for students to stop by and enjoy an intense game of Jenga. The club’s two club leaders, Scarpa (president) and Lee (vice-president) invite Kennedy students to stop by and enjoy an intense game of Jenga in a fun and safe space. Massimo Giordano at a Jenga Club meeting. Photo by Sid Slesiki, Photo Editor. Jenga is an intense game that tests the skills and strategies of each players. Regardless of the experience of each member, the Jenga Club community is outgoing and close to one another. Not to mention, there are Jenga Club competitions! “There are some crazy competitions going on! Everyone wants to be the victor and everyone is really engaged when we have these competitions. Everyone wants to be on top because we give out prizes for our Jenga winners. You pretty much get to go down on the Hall of Fame in Jenga,” exclaimed Vice-President Lee. The Jenga Club shows that playing Jenga brings out the best in people and sheds light to their greatest potential while being able to hang out and get a thrill from playing this competitive game. The Jenga Club has their meetings every Fridays, during lunch time in T-12.